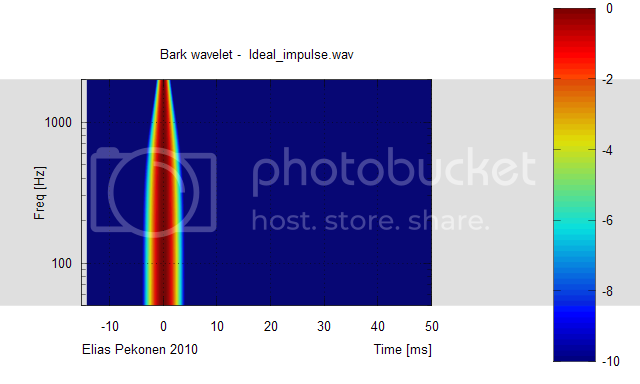 In order to compare how monopole box and dipole line array behave in normal domestic listening room I'm using my recently developed Bark wavelet to analyse the room impulse response. 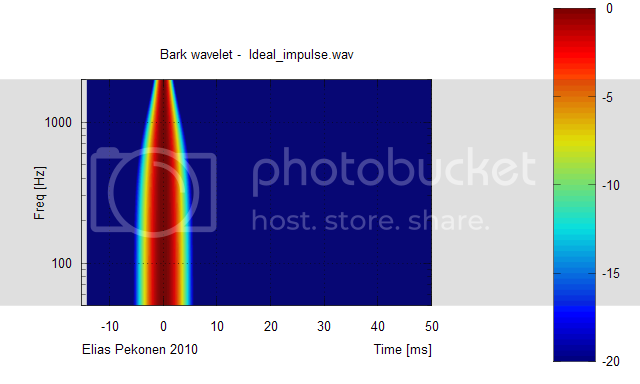 Bark wavelet is based on critical bandwidths of basilar membrane in cochlea. Monopole box and dipole line array have totally different radiation patterns which of course is the main reason for their characteristic room behaviours. 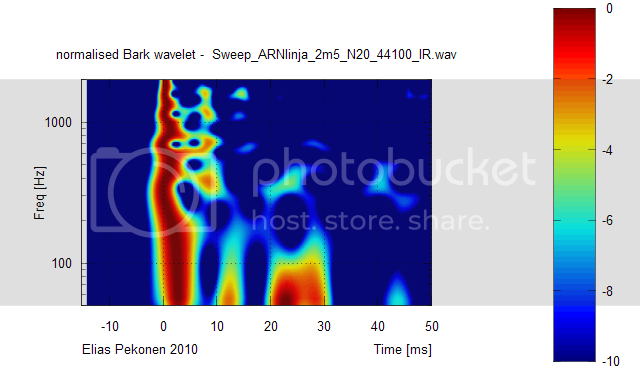 Here I look at freq range of 50Hz - 2kHz and time scale up to 50ms. Besides my dipole line array is used as an array only up that freq, and that range should capture the main phenomena what affects the room response. The monopole is a two way with 6.5" bass midrange and a tweeter. The speakers are placed about 1m from front wall and about 0.8m from the side wall. The room size is about 3.2m * 7m. The measurement distance is 2.5m which corresponds the real listening distance in this room. Thus the mic is placed at the listening spot above a soffa. The monopole box response is totally scattered. It is without any structual integrity. The dipole line array has one coherent and dominating energy wavefront at 0ms. The energy at all frequencies arrive at the same time at the listening position. Main reflection is the front wall reflection at about 8ms. Normalisation highlights the temporal aspects of the room responses. 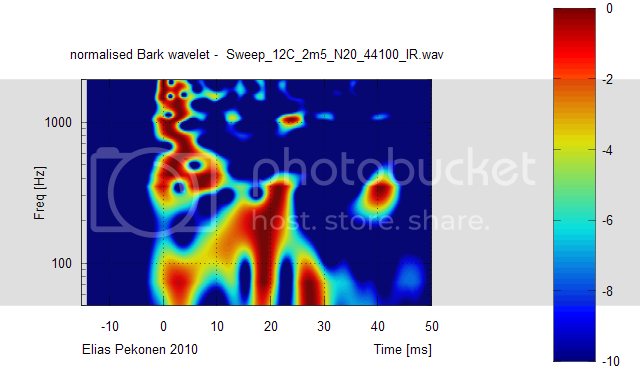 This is not only visible, but it is perceived by ear during my listening test comparing monopole boxes and dipole line array during the past 5 years or so. I've had both types of speakers in my living room for years where I can A/B switch them, and the result remains allways the same. Dipole line array sound so much better in a room!! Nice opening and interesting idea. It would be interesting to know whether the "line arrayness" or "dipoleness" is the main reason for time coherent wavefront, and if they are both the factors, what are their ratio/proportion in the mix. What do you think, which one is the main factor? It figures that it can be found out by measuring a dipole point source and/or monopole line source the same way (preferably a closed box or a LLT-BR box to avoid group delay as much as possible). I do also have dipole line arrays, and have also liked their sound. Last edited by Legis; 12th October 2010 at 09:56 PM. The structure above 400 Hz isn't that bad. We compare a two source system with a multi source system. 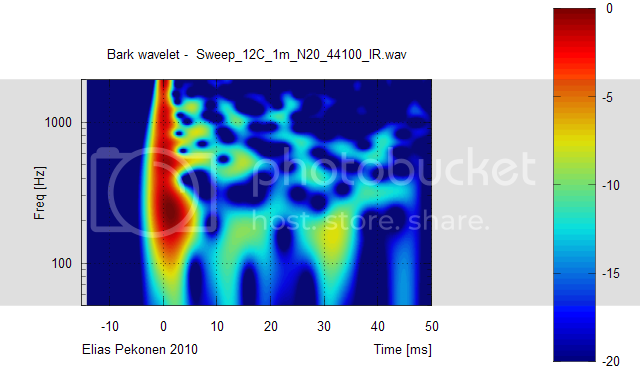 But how do you explain that the monopole response around 200 Hz starts at least 10 ms after the higher frequencies and is missing almost anything below 100 Hz? Is this a closed box or a BR system? It would not make much sense if this were a comparison between a poorly designed/equipped mono source against some sophisticated dipole system. Could you give some more info about the sources? Just for fun, how would you feel about dragging them into the backyard and doing a spectrum for that? It would be interesting to know whether the "line arrayness" or "dipoleness" is the main reason for time coherent wavefront, and if they are both the factors, what are their ratio/proportion in the mix. It is an interesting and fun experiment but I think Legis has a point here. The differences between the 2 speakers (6" 2 way vs dipole line array) might be too many and to determine if it is indeed the dipole radiation that affects the dispersion one would either have to put the line array in a box or use a simple 2 way dipole. The trouble there is that most dipoles I have seen/heard are large using multiple 12-18" woofers. So to really determine if it is indeed the dipole radiation one would have to compare a large dipole (as most are) to a similarly sized monopole. Granted, Elias, that one might have similar dipole and monopole speakers lying around so you have merely posted based on the speaker you did have lying around. What makes you believe that the effects you have measured are due to the dipole radiation pattern? Can you measure the 6" 2 way with the back panel removed? 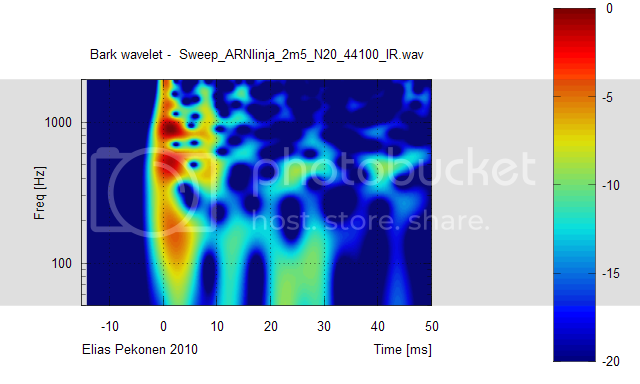 The bass might disapear but the data might be comparable above 200Hz. ...still looking for the holy grail. Last edited by navin; 13th October 2010 at 10:03 AM. I use a dipole line array too,and sometimes a closed box,for casual auditioning.The difference in room loading is enormous.Sadly,I do not have the means, to produce results,even hinting at yours. But I can say that boxed loudspeakers of any kind,are disappointing when compared to a dipole line array of equal proportions. You are aware of course of Dr Griffin.He wrote a paper on line arrays,and dipole line arrays.There would be no better place to solve anything related to it. The first in the list gives least room influence, the last one is the most influenced by the room. What should be interesting is the difference between monopole line array and single dipole. I do have various dipoles to measure, but not any monopole line array. There is nothing wrong in the monopole speaker itself I was using. Here's the response at 1m distance. In nearfield the room reflections are at lower level and the response is having some consistency. 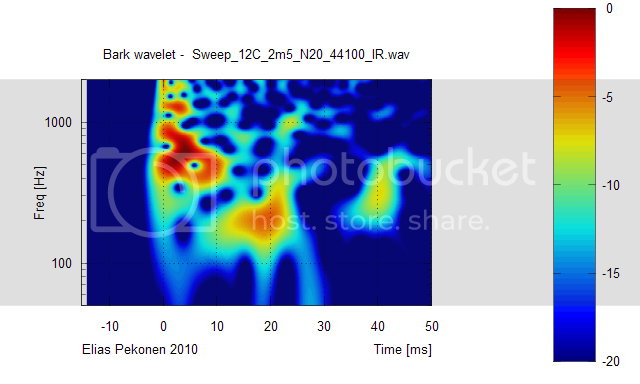 The monopole has too wide radiation pattern, too many room reflections arrive at the listening position and some of them cancel and some of them boost the response. Note that this interference has strong temporal aspect and coherent wavefront is break into 'energy dumbs' that splash the listener. I don't know, but some say they enjoy omnidirectional speakers (like Pluto) in a room. I know Linkwitz recommends setting the listening distance of Pluto closer than normal, and that is propably the reason why it can sound good. Please note also that I'm not attacking against Pluto. thank you very much for posting your inroom measurements. In my opinion there is no "either or" in the dipole vs.
line array effect, the difference is due to both. listening seat in the longest room dimension. caused by the dipole (side) notches. the dipole is placed with appropriate distance to the rear wall. excitation of room modes is relevant. reproducing a broadband transient signal. monopoles in the same room. question has somewhat higher or lower Q. Last edited by LineArray; 22nd October 2010 at 06:49 PM.